Adopting the best that has been done before us, learning from the mistakes of others, we create the most efficient, safe and reliable transport system of all that ever existed. Advantages of skyway technology are based on experience and achievements of entire humanity in the sphere of road construction and vehicle creation. adopting the best what was created before us, learning from the mistakes of others, we are creating the safest, the most cost-efficient and reliable transport system of all that have ever existed. Innovative character of skyway technology is due to an original and effective combination of widely known engineering and technological solutions. 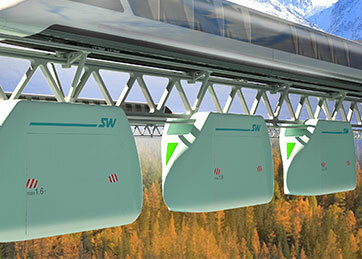 Each separate component of skyway transport system is not something unique – it is the character of component connection into the system that ensures its unprecedented design and operational features. 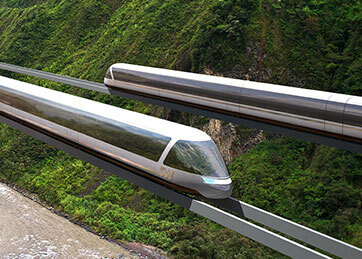 Pre-stressed rail allows to solve the problem of thermal distortion and makes route construction possible even in the most adverse climatic conditions. Uncut structure of a string rail strained between anchor supports gives high evenness of the track and reduces road construction costs by times. More simple design of the supporting node compared to a split flyover makes vehicle movement smooth and comfortable for a passenger. Vehicle location above the ground level ensures its improved aerodynamic characteristics and significantly reduces energy consumption during movement. 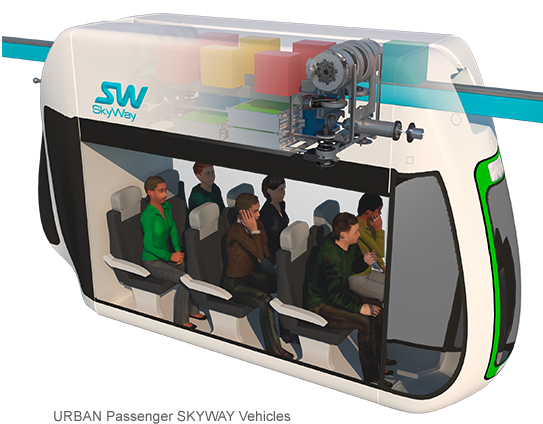 With special configurations, efficiency of SkyWay transport systems can be additionally improved using a gravity engine. 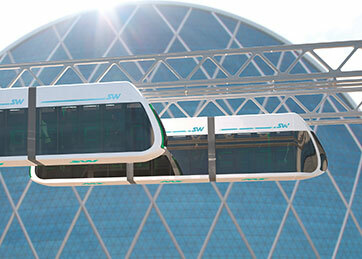 SkyWay transport systems can provide uninterrupted passenger and cargo transportation in volumes, which are satisfactory even for modern megalopolises.